Our mission: To provide quality, professional care to injured and orphaned wildlife in conjunction with educational programs on wildlife and the environment. The Pauline S. Schneegas Wildlife Foundation (PSSWF) is located in rural Garfield County near the town of Silt. We rehabilitate all species of wildlife and provide educational programs to schools, clubs, groups, and businesses. We primarily serve Garfield, Mesa, Pitkin, Eagle, and Rio Blanco counties, but also take in wildlife from all over the state for care and rehabilitation. We are one of only a handful of rehabilitation centers in Western Colorado. PSSWF works closely with, but is NOT funded by Colorado Parks and Wildlife, US Fish and Wildlife Service, or local government or animal control departments. The Foundation accepts all species of wildlife brought in by public agencies as well as by private citizens. The Pauline S. Schneegas Wildlife Foundation sits on the historic property of Nanci's husband Paul's family. Paul operates a beekeeping business from the property as well. To learn about the beekeeping, click here. Nanci Limbach founded the wildlife rehabilitation center in 1984. Her grandmother, Pauline, was passionate about wildlife and believed in the value of the center. Following Pauline’s death in 1991, funds left to Nanci were used to build our first “flight cage.” It was then that Nanci renamed the center and began the Pauline S. Schneegas Wildlife Foundation. Since then, PSSWF has been growing and quietly, but effectively serving Colorado’s wildlife population. In 2004, PSSWF added Arrowhead Veterinary Hospital in Fruita as a satellite facility, allowing us to better serve Western Colorado. Nanci founded PSSWF, and has donated her time to the Foundation since it began. 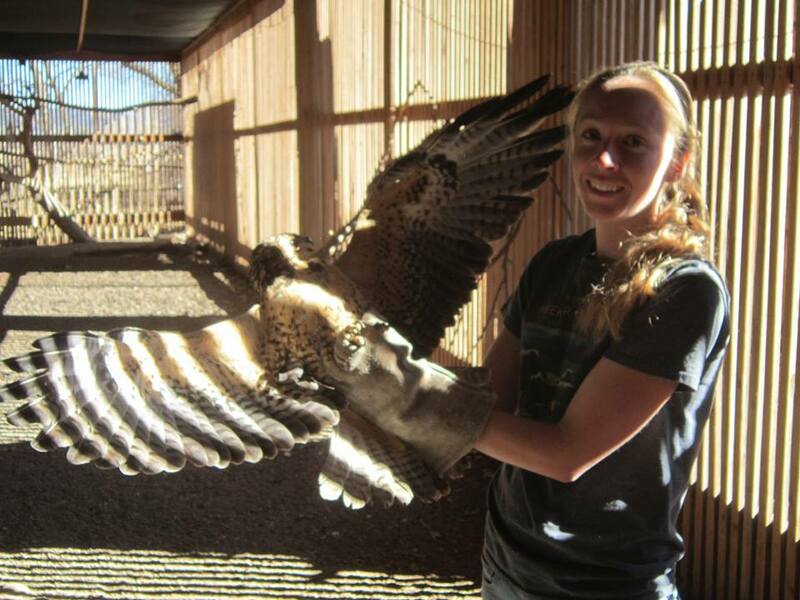 She is a Certified Veterinary Technician and maintains her teaching certificate and is a licensed wildlife rehabilitator in the state of Colorado. She is pictured here with her husband, Paul, and former educational owl Gandalf. Dr. Bingham has been with PSSWF since 2004. He has an extensive background with wildlife as a veterinarian. He is a licensed wildlife rehabilitator and donates all of his services to the Foundation. He is pictured here with one of his herding border collies. Erin has been with the Foundation since 2010. She has her B.S. in Animal Science and is also a Certified Veterinary Technician. She is also licensed as a wildlife rehabilitator.